When I think of sweet potatoes, so many sweet, wonderful memories come to mind. Sweet potatoes are very comforting. Whether they’re baked, candied, in the sweet potato pancakes, or in these waffles, they always remind me of my grandmother’s hugs. I guess that’s why I just love sweet potatoes.From Melba’s American Comfort. *My son likes his sweet potato waffles made with vanilla coconut milk. Try it and see if you like it. In a large bowl, whisk together the flour, sugar, baking powder, salt, cinnamon, and nutmeg until well combined. In another bowl, whisk together the half-and-half, mashed potatoes, melted butter, and the egg yolks. In a small bowl, with an electric hand mixer, whisk the egg whites on high speed until they form stiff peaks, about 2 minutes. Set aside. Make a well in the center of the dry ingredients and pour in the wet ingredients. Whisk together, starting slowly, until well combined but not overmixed. Gently fold in the beaten egg whites, making sure not to deflate them. Spray the waffle iron with nonstick cooking spray or brush it with a bit of vegetable oil or butter and pour in enough of the batter to fill it halfway. The waffles will rise as they cook, and the amount of batter will vary from one waffle iron to another. Close the lid and cook for 3 to 4 minutes, until cooked through and golden brown. Repeat with the remaining batter, respraying the waffle iron before each addition. 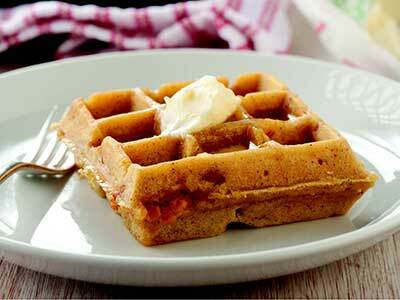 Serve with butter, maple syrup, whipped cream, fresh fruit, ice cream, or with chicken instead of the Eggnog Waffles. Any way you eat them, they’re sweet potato good! There are many different kinds of waffle irons and many different suggestions for how to clean them. Some say to never touch it until it’s completely cooled, but one of my favorite suggestions (because it seems the easiest) is to UNPLUG IT (very important) and, while it’s still hot, place a wet (but not dripping) paper towel on the surface, close the lid, and let it steam itself clean for a few minutes. Then, while it’s still warm, wipe away any lingering crumbs. If you still have the manufacturer’s instruction booklet that came with the iron, I’d recommend that you follow the directions in that! 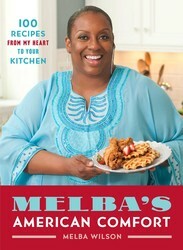 Fresh from the kitchen of her legendary Harlem restaurant, Melba’s, the reigning queen of American comfort food serves up one hundred delectable recipes that put her own special touch on favorite dishes—and taste just like home.Where do celebrities and foodies go for the most delicious fried chicken and eggnog waffles? To Melba’s, of course! Melba Wilson is a sweet, upbeat, occasionally sassy, always genuine ambassador for the cuisine known for years as soul food but that she prefers to call American comfort food. Melba cut her culinary teeth at the iconic Sylvia’s, the famed Windows on the World, and the hugely popular Rosa Mexicano. Now, as the pioneering owner of her own legendary Harlem restaurant, she proudly holds court in Melba’s always-packed dining room, dishing out lovingly prepared sweet potato pie, wine-braised short ribs, BBQ turkey meatloaf, deviled eggs, and a legion of mouth-watering American classics as well as unforgettable special twists on beloved comfort foods. Now you don’t have to leave the comfort of your own home to dig into her sumptuous signature recipes! With mouthwatering full-color photography and a beautiful design, Melba’s American Comfort features the secrets of her irresistible home cooking, passed down from her great-grandmother and other talented generations and given her own loving variations, plus a treasure trove of delightful stories from the heart of her bustling kitchen. Melba Wilson is the owner of a growing culinary empire based in New York’s famed Harlem neighborhood. Her renowned restaurant, Melba’s, is a hot spot for celebrities, locals and tourists from around the world who crave unbeatable American comfort food. She began her career at Sylvia’s Restaurant, where she launched the popular Sunday Gospel Brunch, and has received numerous accolades and awards for her entrepreneurship and her original and family recipes. She won on an episode of the Food Network’s Throwdown with Bobby Flay, was featured on The View, and appears regularly on television, most recently on CNBC’s reality show, Consumed. She lives in New York with her son.